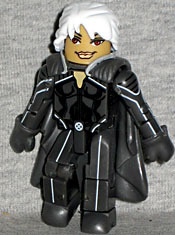 Minimates Series 14, released in March 2007, was based entirely on X-Men: The Last Stand. Storm, here, actually had three figures in the first movie line, but hadn't had any since. The costume is mostly the same - black leather with a cape - but in the third movie, her hair actually managed to look like hair instead of a wig. The Minimate gets new hair, clearly, but the cape and its attached shoulder pads are a new piece, as well. Pretty sure no one had these gloves before, either. But why? The normal hands would have worked fine. The body is molded in dark grey plastic, rather than black, so the details of her costume can be painted on - black shading and white piping. The face is about as "Halle Berry"-ish as a simple block with no nose can possibly be. 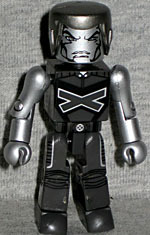 There was (unofficial) word in '06 that an X3 Colossus figure was coming, but this Minimate made it to stores first. It's the third Colossus Minimate, but the first based on the movies. His costume is accurate to the film, cast in grey just like Storm, but with an entirely different pattern painted on. His piping is done in silver rather than white, too. Befitting the team strong guy, he has bare arms - there's no "muscle" detailing there, but he doesn't really need it. The face and arms are silver, of course, so it's just the clothes and the hair that make this Colossus instead of Silver Surfer. Rather than reusing the hair the previous two Colossus Minimates had, this figure gets a new one - unfortunately, it's bigger than the old one, so it looks the wrong size for his head. It would have been nice if he got something to bulk up his chest, so he didn't look scrawny next to Juggernaut.